I'm so excited. I just received a book in the mail today that I've been seeking for literally years. It's extremely rare and difficult to find. 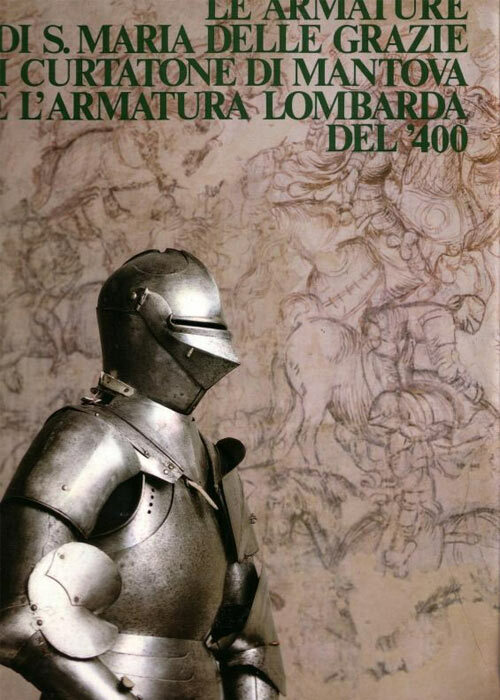 It's Le Armatura di S. Maria delle Grazie di Curatone di Mantova e L'Armature Lombarda del '400, by Boccia, Lionello G.
The book contains hundreds of fantastic images both in black and white and in color. These photos document at great detail and in multiple views several wonderful examples of Italian armours discovered in the Sanctuary of the Madonna delle Grazie of Curtatone Mantova. I've seen some of the text translated into English and it makes me wish I had the entire book translated. The volume was produced in a numbered limited edition of 2000 and mine is #975. I'm completely thrilled to finally get this book. I expect a book that you have, Nathan: Armi Bianche Italiane. 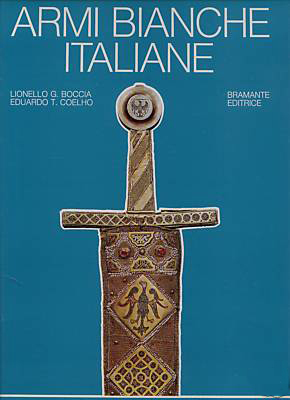 The authors of the usual: Boccia, Lionello G.
Bramante publisher. The cost is € 450. I wonder why all their works will cost a fortune. But that I am Italian, I can not have them. One less in my wish list . Notice the sword of Frederick II Hohenstaufen on the cover. Nathan, your sword collection always has me drooling, but this is just going too far. One day I'm sure, there'll be a PDF version available, and perhaps I'll get to see it then. I'd love an English version, but to be completely honest, I'm more interested in the pictures than the text. A truly enviable addition to you collection. That is a beautiful book. Only browsed through it once, but I can attest to the fact it is splendid. A very satisfying book! Enjoy! (ok, I'm biased toward the Lombardia). If you ever need help for the translation, feel free to call. Yeah, that's a great one. I love my copy of Armi Bianche. I suspect they are expensive because they only printed a small number, and because they printed them 15-20 years ago or more. So they are out of print and rare. It's the old supplyand demand principle: limited supply = high demand and high price. I own a copy of this book. It's one of my favorites, too. In fact, my own harness is a reproduction of one of the suits depicted in there. they are in our public library and some other in the provincial network, but they can be consulted only in the library, no home loan. For me however nothing can substitute direct measurements. Bramante's catalog is owned by Mondadori and it won't be reprinted for lack of a number of customers sufficient to justify a reprint. Prices of used books are outrageous. But yeah, I've always wondered why it's the really well done and *useful* works that get stuck with the limited print, and all the crappy half-researched books that make the mass market? I found acopy of a publication written by James Mann. 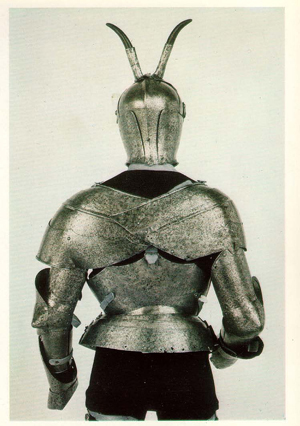 The paper was published in the 1930's and covers a wonderful account of the armour from the Sanctuary of the Madonna delle Grazie. 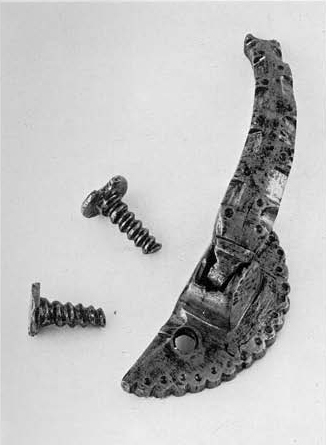 It shows many photos of the armour in situ, still hanging on the original paper mache dummies as well as close-ups of the individual components and armourers marks. A nice companion to the book! 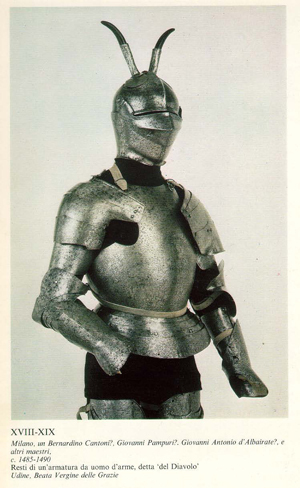 and to think that some of these armors threatened to be thrown away, only in 1930 was given a fair value. Special thanks to my friend Roberto, long ago gave me this wonderful book. I have this photo in my bedroom. what type is this? It is the abandonment of these armors were very bad. Maybe the rust, dust and pieces missing, they did seem armature paper mache dummies. These armors have really risked destruction. A special that really impressed me at that time: simple screws. I believe that here there are people better me. They can explain. I want still try to tell mine. The diamond section tells me that the sword must be dated later 1400. The pommel of a variant type T.
I advise you not to take gold for what I wrote. I advise you the photos of Ms Sabrina Ferilli. The king is Felipe I of Castilla. i think it's a XVIIIa's type too but the fuller is too big. It's too strange sword! This sword seems to have a exagonal section ending into a diamond section. i think the guard is a type 1 with circular section. PS: excuse me for ot.